It means having a strong attraction or desire for anything, and the word itself suggests a negative connotation. It is a force of habit, which has negative consequences, especially when it comes to our health. It may either be due to the corrosive nature of the parasitic character of the method itself. Addiction has enormously disastrous effects on the body, mind, and soul of the addicted person. Addiction also ruins a person’s personal and social life. Society tends to discriminate against an addict in a very judgmental fashion, often to an extent where that person becomes extremely unacceptable to the patterns of society. Such people become alienated from the routines of a normal life. Addictions tend to weaken the body and, after taking the addicted substances, the addict feels pacified or sated. However, this sated feeling does not last for a long time. It is incredibly short lived and not worth the consequences. The problem is that in the long run, addiction results in weakening the body and paves the way for dysfunction of both the body workings and the brain. Addictions include anything: foods, drinks, or other physical substances, but also co-dependency, a hostile attitude towards others and greed. Human beings are programmed to like sugar and are genetically prone to enjoy sugary food more than other types of food. 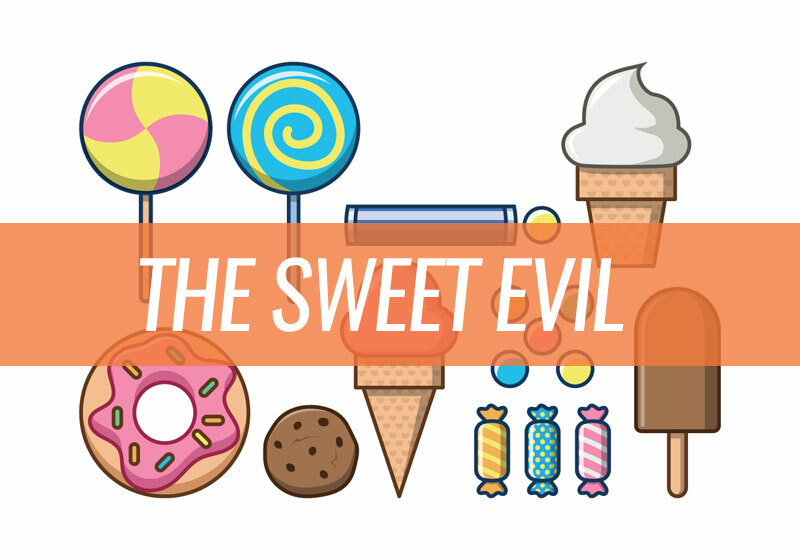 Almost all of us are genetically hardwired to favor a sweet dish over anything else. Excessive use results in diabetes, trouble losing weight and other sugar related problems that have begun to crop up recently. Even people who do not want to take sugar are sometimes unaware of taking it because sugar is latent in almost all foods we have in our diet. Excessive intake of sugar keeps you overweight, unhealthy and fatigued. It’s not surprising then that many recent online diet programs like the South Beach Diet, Beyond Diet, Weight Watchers all ask you to cut down on sugar as much as possible (read this). Sugar is quite hard to get rid of and can be very deadly for people who get a very little amount of exercise. Watching diets closely is not something practical in the modern world. Most of us do not realize what is happening until it is too late. Sugar can cause addiction and sugar cravings, which is not natural. For your health, sound and balanced life, sugar addiction can be one of the greatest impediments. If you need to be sure of good health, a sound mind and permanent weight loss or weight stability, you have to be serious and selective about consuming sugar and sugary substances. 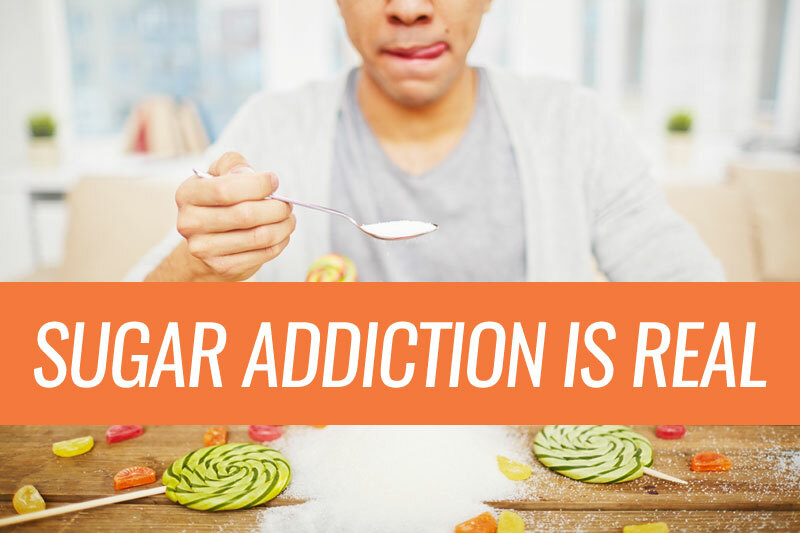 In this post, I hope to help define what sugar addiction is, and help you identify the symptoms. I would also like to show you how to distinguish between a healthy usage of sugar and how it crosses the line to become an addictive substance. I’ll also give you a quick treatment plan and steps on how to stop cravings. You can overcome sugar addiction! I’m here to help you do it, and the advice given in this book is sound advice, based both on experience and expertise in the subject. Rest assured. You will find help within this post, and it may just save your life. Research and studies have proven time and again that most people that remove or drastically reduce sugar from their diet are going to lose weight. This is inevitable because when you are removing fatty processed and high sugar foods from your diet, this means you are taking in fewer calories. When you eat fewer calories, you’re going to lose weight. The numbers don’t lie. Weighing your blood sugar levels is essential for overall fitness and well-being, healthy hormones, directing your body to burn more stored fat, and boosting your metabolism to shed pounds, according to Dr. Oz. What happens is people make a habit of eating unhealthy sugary processed foods that trigger repeated spikes in blood sugars. This not only affects your mood and increased risk of disease, but it also interferes with your ability to lose weight. With high blood sugar levels, you are communicating with your body to store more fat and not burn it. Balance is important, and that comes from removing extra sugars and eating a healthy well-balanced diet. Having the courage to recognize you have a sugar addiction and WANTING to take action. Gain the knowledge required to create your plan and make it happen. Psychology Today experts say it takes more than six months of repeating an action to make it a habit. That’s where you don’t have to focus so intensely on the new action. Change is tough, and we are resistant to it. FACT: If you want to leave your sugar cravings at the candy store you are going to have to crave change and make it stick. You are in control of you; so, ultimately, there’s nobody to point the finger at but yourself if you decide to jump ship and not climb back on. There are lots of different tactics and strategies to get the sugar off your plate and out of your mind. Here are a 7 tips to get you started. Give Yourself a Taste – WebMD dietitians believe you should start by giving yourself a little. Most people fail because they try to go cold turkey, shock their system, and quickly slip back into their unhealthy habits. Have two bites of cake or a mini chocolate bar. If you are feeling completely deprived, you are more likely to fail. Try Finding Combinations – This one is just like sitting on the fence. You are looking to get nutritious with a little treat. Have a few strawberries dipped in chocolate. Or a sprinkle of brown sugar on your oatmeal. A nut mixture with a few smarties in it hits the spot. This will help you crave healthy foods, and the extras will soon fade away. Flip the Switch – This is a tough move. Just be wary the first few days afterward you may be feeling a little “off.” Depending on how much sugar your body was used to. Your cravings will dissipate, but you have to be willing to wait it out. Turn Up the Fruit Volume – Initially, this may seem like a cheap consolation prize. Out of your Halloween treat bag do you want an apple or a peanut butter cup? By eating more fruit, you will curb your craving for fructose faster. And if you stick with it long enough you’re going to start craving all-natural ripe and tasty fruit! Take Up a New Hobby – I call this one the distraction method. If you start thinking about chocolate ice-cream or fresh baked cookies, hop on your horse or practice your golf swing. Get excited about something new in your life to help forget about sugar. Get Support – It’s funny in life how many times we are okay with disappointing ourselves, but we’re not so good with letting other people down. Shout it out to the world your commitment to knock excess sugar out of your life and let your cheerleaders help keep you on track. Eat every 3-4 Hours – By making sure you eat small meals regularly, you’ll keep your blood sugars level and ward off sugar cravings. Willpower gets incredibly difficult on an empty stomach. Get Back On Your Horse – If you happen to fall when you’re out with friends and decide to eat a big ice-cream sundae, or you dive into the cookie one night when you were feeling bummed; pick you up and move on. Don’t worry about it, because we all steer off course from time to time. One slip up won’t kill you. Just make sure it’s the exception to the rules. Carbohydrates and sugars are as addicting, if not more so than a drug and for this reason; all sugars must be cut out of your diet completely. Part of quitting sugar is to know what you can and cannot eat. While the diet will be focused around wholesome foods like proteins and nutrient-dense veggies, there are still foods that you must avoid like potatoes and similar starches. Keep reading to learn the foods to eat and avoid on the 21-Day Sugar Detox Diet. Proteins – Proteins are an essential part of the sugar detox diet since they keep you feeling full and help balance your blood sugar. It is especially beneficial to start the morning with a breakfast packed full of protein. Vegetables – Low-starch veggies are encouraged on the Sugar Detox Diet. They contain carbohydrates, but these are not digested the same way that starches and sugars are. In fact, you can eat as many fresh veggies as you want since they are low-calorie and full of nutrition. Processed foods – ‘Healthy’ foods like yogurt and granola bars may be full of sugars or artificial sweeteners that harm your dieting efforts. Others like pre-made lunches and crackers are even worse. Avoid all processed foods and replace them with wholesome choices that will help curb cravings and leave you feeling full and energized. Grain products – In the first ten days of the diet, you should avoid all grain products. Switch out tortilla shells or a hamburger bun for a lettuce wrap. Avoid artificial sweeteners and additives for your coffee, as well as sports drinks and other sugar-filled products. Starch-filled Vegetables – You should also avoid any starchy vegetables in the first ten days of your diet. This includes winter squash, sweet potatoes, beets, and other potatoes (red, white, yellow, etc.). Dairy – Something else to avoid in the first ten days of the 21-Day Sugar Detox Diet is dairy products. This is because you may have a sensitivity to the lactose in dairy without realizing it. You can switch this out for alternatives like almond milk and soy. So that’s it, simply by eating the foods recommended and avoiding the ones mentioned above, you should be able to reduce your sugar cravings and addictive behavior by at least 75-80%. As for weight loss, simply give this way of eating a try and you will actually start losing weight without even doing anything else! Unsweetened tea: Research has shown that green tea has a positive effect on your general health. It can also help reduce your blood pressure and lower your LDL cholesterol levels. Some research suggests that drinking up to six cups a day may lower your risk of type 2 diabetes. However, more research is needed. Whether you choose green, black, or herbal tea, you should avoid sweeteners. For a refreshing taste, make your own iced tea using a chilled fragrant tea, such as rooibos, and add a few slices of lemon. If you don’t mind caffeine, Earl Grey and jasmine green tea are also great options. Unsweetened coffee: A 2012 study found that drinking coffee might help lower your risk of developing type 2 diabetes. Researchers found that the level of risk dropped even lower for people who drank two to three cups per day. This also held true for people who drank four or more cups per day. This applies to both caffeinated and decaffeinated coffees; so, if caffeine makes you jittery, feel free to grab a cup of decaf. As with tea, it’s important that your coffee remains unsweetened. Adding milk, cream, or sugar to your coffee increases the overall calorie count and may affect your blood sugar levels. Sugar-free fruit juice: Opt for something that’s sugar-free and 100 percent juice. If you’re using a meal plan, make sure you account for the juice you choose. On average, four ounces has about 15 grams of carbohydrates and about 60 calories. You can also try vegetable juice alternatives. Low-fat milk: Dairy products contain helpful minerals, but they add carbohydrates to your diet. Always choose unsweetened, low-fat, or skim versions of your preferred milk. You should limit yourself to one or two glasses a day. You can also try dairy-free, low-sugar options, such as fortified nut or coconut milk. Be aware that soy and rice milk contain carbohydrates. Sugar addiction is a big hurdle when it comes to weight loss. You can give your health and weight a big boost by drastically reducing the amount of sugar you consume. If not for anything else, at least give this 21-day diet a try for the sake of your body, and just gauge how you feel after just 3 weeks. I am willing to bet my hat you’ll stick with it for many more months or years to come! These days I am in a mood to travel to another country and I really want to change my lifestyle a bit. Truly I spent more than 2 years raising my son sacrificing most of my time for him. Now, he started his playgroup, I can see he is becoming independent and I also thinking of becoming a full time working mom. I am missing my engineer job which I spent most of the time calculating, designing among the new constructions. Yes, my life is there and now it is time for a restart! But, as for most of the moms, it is not easy to change from the stay at home mom life to full time working mom. There are so many challenges. That’s why I decided to find ways to retreat myself and give some more energy and life to myself. As I love to travel and as Thailand is in my bucket list, this time I am looking for having a tour to Thailand. Having detox in Thailand would be great to rejuvenate and start life with new happy and optimistic feelings. While I was searching for detox programs in Thailand, I found Oreon Healing Centre as the best place for detox, healing and retreat in Koh Phangan. Here are some of my findings and I am in love to join with one of their detox programs in Thailand. Strategically located in the magical island of Thailand, Koh Phangan, Oreon Healing Centre offer Thailand Detox Retreat packages which can easily transform you to a new rejuvenate life. Including yoga, healing retreats and detox, I feel this is the perfect place to spend a relaxing and detoxing holiday in Thailand among the sceneries of beautiful Tropical Island. Their programs are really well planned and ensure to give the best during the holiday we spend with them. Popular as the true “Centre of Transformation” Oreon Healing Centre has provided their detox programs for thousands of people around the world and that is one of the reasons for me to select Oreon Healing Centre for another relaxing and detox holiday in Thailand. I know you also like to read more about this new finding of me. For a detox holiday in Thailand, you can visit Oreon Healing Centre www.orionhealing.com and check more details of their programs. 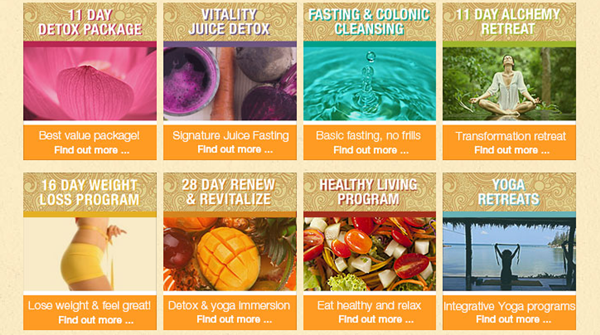 Do you like Detox programs?